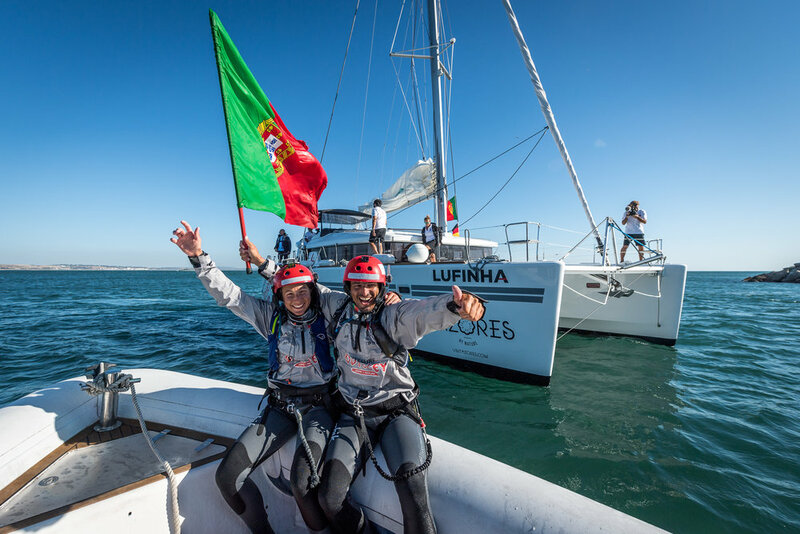 Anke Brandt and Francisco Lufinha set a new world record in an unprecedented Odyssey that began on September 4th in Ponta Delgada on the Island of São Miguel and ended on September 13th in Lissabon. Anke and Francisco and the team were welcomed like heroes in the Marina of Oeiras, Lissabon. After a long cruise of 1 646 km with several obstacles we managed to set a historical mark in nautical sports worldwide. "On 13th September we finished this extreme and hard crossing which demanded of us all our psychic and physical endurance. For most of the time we had to sail against the wind which diverted us from our original route. At times we were even heading straight for Morocco. This made things very difficult. We came across such strong swell and super dark nights as we had never experiencedbefore.. But now the joy at having managed this extreme challenge exceeds all the feelings of excessive strain. In the end we were super happy that we had kept up our faith and had slowly but steadily fought our way towards Portugal. In addition I’m very proud that I was able to support Francisco's dream to finally connect the entire Portuguese Sea with a kite that he had started in 2013 with his first Odyssey. I want to thank you for your kind messages and your support! Thanks to all of you who donated again for "Wings for Life"!" A dream came true and you all are part of it! 2017 is the year of the largest and Ultimate Odyssey in the Portuguese sea. The objective is to connect the Azores to the continent, kitesurfing - more than 1500 km of Atlantic Ocean in its most savage state. With departure scheduled for September 2017 and a minimum duration of 5 days, this crossing will be the most vulnerable to weather changes, accumulated fatigue and danger at sea. The distance is so great, that a motor boat has no possibility to follow. This led the support team to follow the Kitesurfers on a sailboat, free from fuel and environmentally friendly, meeting the project values. The cherry on the cake is the invitation of the Kitesurf world record holder - Anke Brandt to share miles during this long odyssey. The German has the world record for the longest kitesurfing journey, with the 491 km Mark Mark for 30 hours between Bahrain and Abu Dhabi in 2016. Follow this adventure at www.franciscolufinha.com and make sure to tune our social networks Facebook and Instagram, so that you don't miss a thing about this ultimate odyssey on Portuguese Sea!